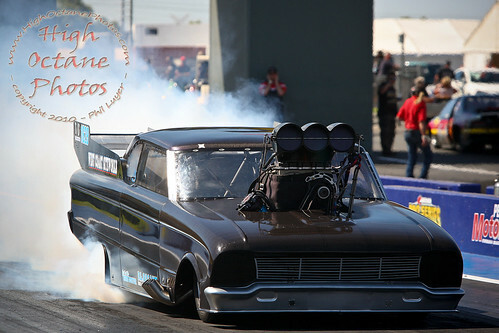 High Octane Photos Blog: One More Sleep Until the Westernationals! 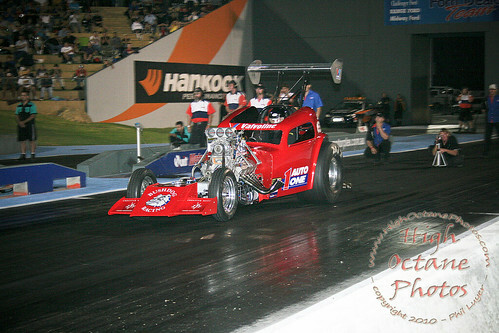 The 2010 Westernationals will get under way at the Perth Motorplex at 11am tomorrow, and I'm thinking back over the Westernationals of the past. 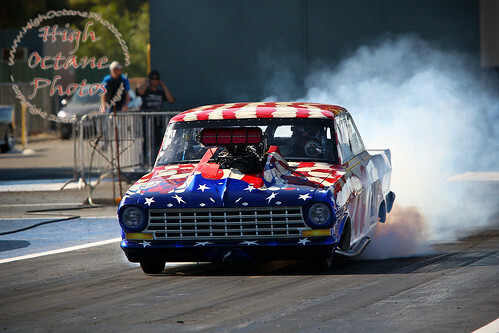 For some reason, I have it stuck in my head that the first major drag racing meeting I shot was the 2003 Westernationals, however, I cannot find any of the photos from that meeting, or any drag racing photos from 2004. I can, however, find photos from the 2005 Westernationals, and the other day I went through those photos and picked out a number of shots that caught my attention in some way. 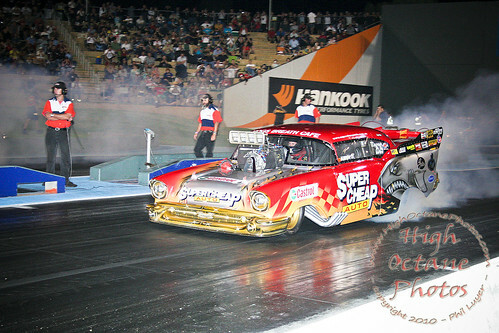 South Australian Gary Busch drives a Funny Car in SuperCharged Outlaws, but 5 years ago he was behind the wheel of this Altered, also a SuperCharged Outlaw. Tony Argentino is another SuperCharged Outlaw driver who has changed cars since 2005. Tony and wife Gillian purchased "The Hitman" from the USA a few years ago, retiring their 34 Ford coupe to do so. Yet another driver making a few changes over the seasons has been Mark Sheehan. 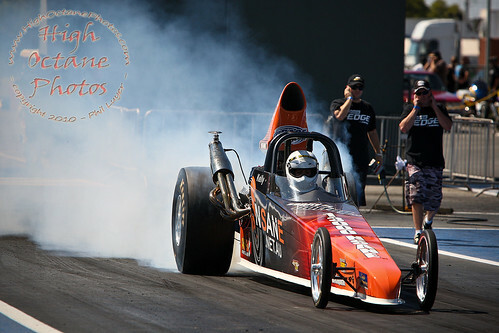 As a relatively new photogapher back in 2005, this dragster, running in Competition, didn't grab my attention any where near as much as it did looking back over the photos the other day and spotting a few markings that suggested it belonged to Mark. The first time that I can remember hearing about Mark Sheehan was as a methanol powered Altered driver. 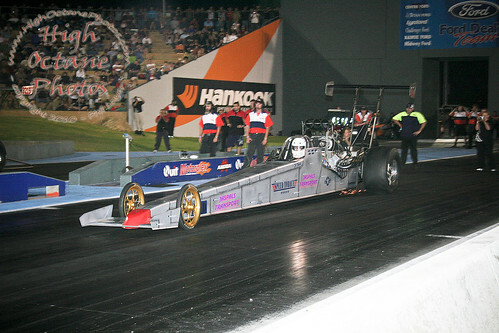 Mark has since moved on again from methanol fuel to nitromethane, having run a couple of half track passes in a nitromethane fuelled Altered before switching to a funny car body and joining an elite group of Australian Nitro Funny Car drivers. This photo is one that has me wondering what happened to my older photos. While it's always possible that I'm just confused and this was my first Westernationals, I definately remember seeing Steve McGrath racing the Toppolino Altered that he sold to Mark Mackay in order to build this car. The Westernationals is a round of the Australian Top Doorslammer championship, and here, Ben Bray is driving the 57 Chevrolet that used to belong to his father, Victor Bray, and is currently being driven by the Northern Territory's Matt Abel. Looking forwards to this years event, the official Motorplex pre-Westernationals Test'n'Tune is always a great event that most people probably don't even know is on. Due to the nature of Test'n'Tunes, it's probably best that people who aren't drag racing tragics don't usually know these are on, as there is no set program and it's not uncommon to have long periods where nothing is happening on the track. 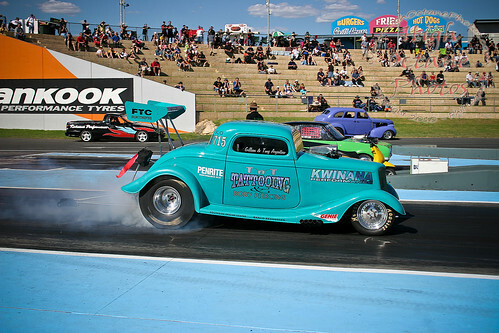 For the die hards however, the Test'n'Tunes are an opportunity to get a sneak peak at a new car or bike, or perhaps a chance to see a team in action that may not have raced at the Motorplex for a while and want to re-acquaint themselves with the track. It's also a chance for even the regular teams to try something a little different with their setup, which can often make for some interesting viewing. I wasn't able to make it to this years Westernationals Test'n'Tune, however Kate Bovell borrowed my camera gear and took a few photos so that I didn't miss out on all the fun. Here, Carmello Belladonna guides his father Vince into the staging beams as they attempt to license Vince's shiny new AA/AP Torana. Vince's long term plans for this car include running in Australia's Top Doorslammer category. Murray O'Connor's stunning Falcon Top Doorslammer has been repaired after a recent incident and is looking as impressive as ever. 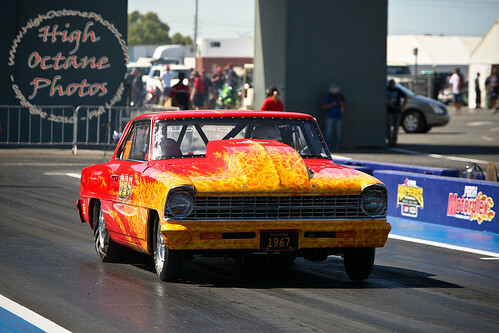 Over 350 teams have entered for this years Westernationals, including around 60 interstate teams, making it the biggest drag racing event ever held in WA, and the biggest 2 day event in Australia.